The 2010 measurement of the Lamb shift (2S-2P energy difference) in the muonic hydrogen atom has created the "proton radius puzzle": The proton charge radius Rp determined from the muonic hydrogen Lamb shift differs by 4 % or 6 standard deviations from the 2014 CODATA value of Rp which has been obtained from elastic electron-proton scattering and spectroscopy of electronic hydrogen and deuterium. The puzzle is both difficult and fascinating because it impacts and requires expertise from diverse areas of particle, nuclear and atomic physics. The puzzle has been discussed in three very fruitful workshops at ECT in Trento and Castle Waldhausen at MITP in Mainz (2012, 2014, 2016). Several new experiments have been motivated by the puzzle and are starting to produce results. Correspondingly, there is a great deal of theory effort aimed at all aspects of the puzzle. 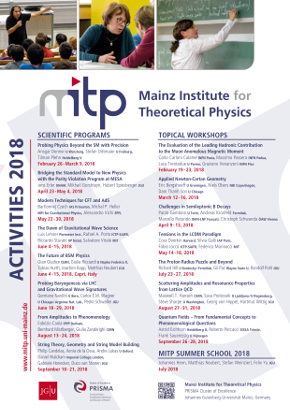 The topical workshop will summarize new experimental results in atomic spectroscopy and lepton scattering; discuss new theoretical tools and ideas impacting structure effects in scattering and bound state problems; and explore new physics discovery potential with precision tests in muonic and electronic systems.